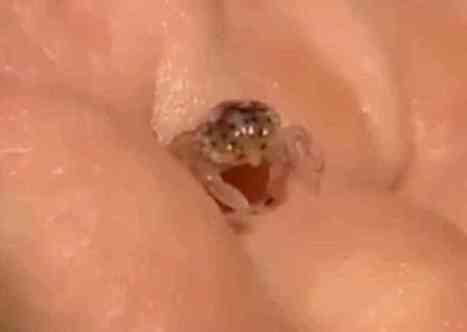 biologists admit that Mystery Crab (Photo from You Tube video)they have never seen anything like this before. Many of the crabs that washed ashore are now dead. Experts theorize that a number of conditions may have caused the beaching -- storms, change in water temperatures, or even pollution. However, Hawaii has not had any of these scenarios lately. Another possibility is that rough seas may have created air bubbles that could have gotten under the shells. This would prevent the crabs from being able to dive out of the way from the tide. The invasion was first reported by a lifeguard as surfers were telling her that the tiny creatures were climbing onto their boards and then continuing on to them. Perhaps they were concerned initially that these actually were "purple people eaters."